This painting is a joyous celebration of the legendary steersman, Joseph “Nappy” Napoleon. Nappy was only seventeen when he paddled across the Kaiwi Channel with the Waikīkī Surf Club in 1958 – the seventh year of the now very famous “Moloka’i Hoe” (41 mile race between Moloka’i and O’ahu). Nappy’s crew placed first over-all in 1958 and, never missing a year, last September (2009) marked Nappy’s fifty-second consecutive crossing. In 1983, Nappy and his wife Anona started a club of their own: the ‘Ānuenue (rainbow) Club, a club where their five sons would develop and thrive and become part of its future. The waters of Waikīkī are ‘Ānuenue‘s “playground” – usually late in the day with the low sun spilling over Diamond Head Crater and across the rolling waves, in a magical profusion of pastels as the sun transforms the white clouds to ivory and peach and the reflections of these clouds do their dance of light on the waves, the shadows dipping to lavender. 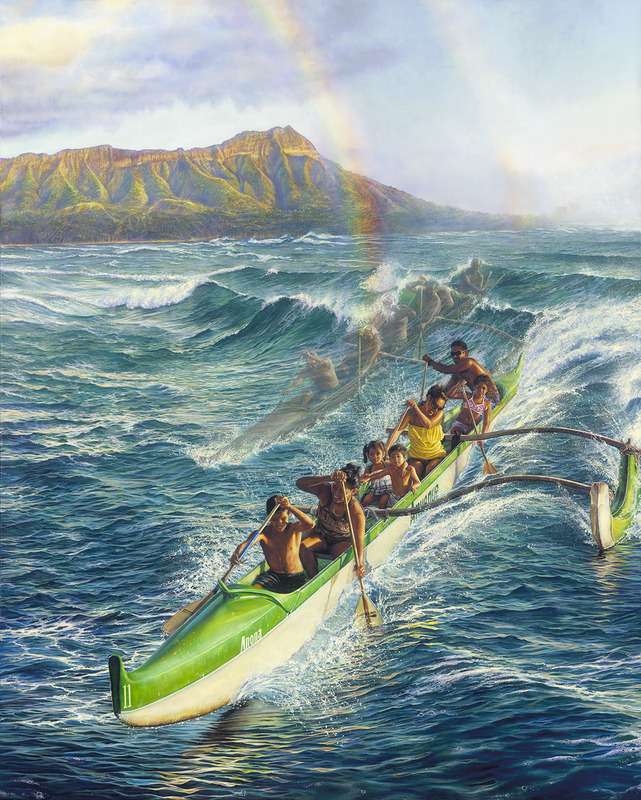 When I began compiling my research for this painting, I thought how apt it would be to include a rainbow and I wondered it one would ever see one over Diamond Head from the canoe site. The day I went to the canoe site with my camera to get started on my project, there was a rare rainbow over Diamond Head to “answer my unspoken question.” I took this as a sign and as a blessing on this painting. The canoe in the foreground is filled with Nappy and Anona’s grandchildren (from three of their five sons – and one great-grandson in seat three, in front of his mother in seat four). Their two-fold heritage from Nappy is well-marked by the double rainbow since, first, they inherited life itself from Nappy (and Anona) and, secondly, they inherited Nappy’s great love of the ocean and passion for paddling. Again, a tightly woven tapestry of past and present with the light and airy vertical threads of the present, softly interlaced with the dark, rich horizontal threads of the past. To see the present without the past is to see it stripped of shadow and depth and you are left with only bright, colorful loose threads, devoid of form and texture. And, as I always gently remind people, “I don’t paint ghosts. I paint an influence.” That being said, the men in the spirit canoe are some of Nappy’s crew – familiar faces at the races for many years… part of the legacy of ‘Ānuenue Canoe Club and Nappy… my friends. The models in the spirit canoe are: seat one, Babe Bell; seat two, Kamuela Magno; seat three, Samson Rodrigues; seat four, Keith Kaleo; seat six, Nappy Napoleon. The models in the real life canoe are: seat one, Riggs Napoleon (son of Aaron); seat two, Mahealani Napoleon (daughter of Darryn); seat three, Makamae Napoleon (daughter of Jonah) and Hōkū (Dayton) Napoleon (son of Taron); seat four, Taron Napoleon (daughter of Aaron), seat five, Kainani Napoleon (daughter of Darryn), and seat six, Sepa Napoleon (son of Darryn). I treasure the years I have paddled with ‘Ānuenue and I treasure the coaching I have had there. There was no greater reassurance to me in a race than to have Nappy as a steersman. He could always find the “line,” could always get that extra edge, and, if there was a wave to ride (even a small bump), we were on it!